Rudis Sylva company starts selling the third collection of watches has become iconic generator harmonic oscillations, which emphasized virtuosity graceful decorative finish. Two balance interconnected gear that provides the same range of their deviations. Symmetry and generated energy balance springs are in constant combat, any time would eliminate the error of gravity even in the upright position. Made of titanium bridge appears in all its splendor beveled by hand 28 interior angles. The more so that the treatment of the interior angles of titanium takes 10 times longer than the rounded corners of the steel! The lower part of this most important part is decorated with hand-guilloche “pyramid.” Each line of the picture consists of 60 pyramids, decreasing in size from the edges of the items to the center. It is difficult to imagine how much hard work required for such enforcement guilloche. Exquisite handmade wizard with a binocular microscope was embodied in an elegant engraving of the bridge double drum, as well as finishing in the rear housing cover, decorated with the image of the sundial and the brand name with the brand name. Crushed by hand quartz grit mixed with water. This material was then applied to the surface of the pre-engraved by hand and placed in the oven, preheated to a temperature of 840 degrees. In the final step carefully polished enamel coating, giving unrivaled views of the image of a sundial. 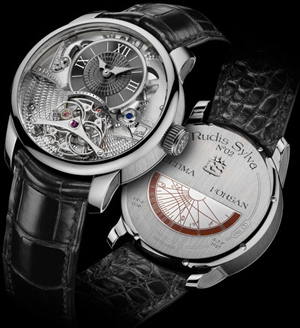 The unique design of harmonic oscillations generator factory Rudis Sylva, its ability to fully compensate for the gravitational influence, has brought unbelievable success of the brand products, much ahead of all currently existing watch with a tourbillon. Decorative trim hand makes each item unique work of high school watchmaking. Piaget company has breathed into his first boutique in Zurich, a new life!